Walk among the coconut trees and flowers of the grounds of this temple. 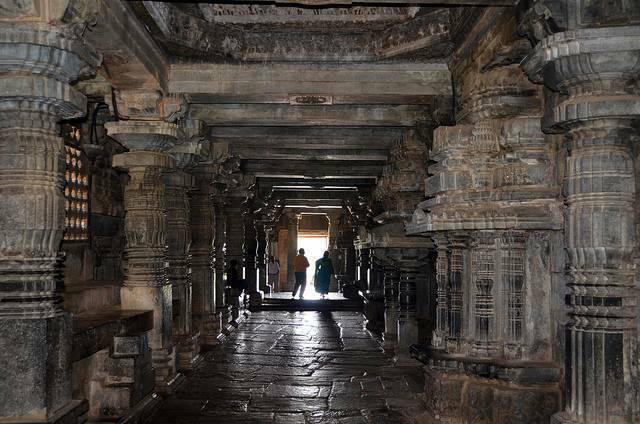 It was finished in 1121 CE and is dedicated to Shiva. The temple boasts many intriguing decorated pillars and sculptures. There are 240 sculptures that run along the outer walls, and these sculptures are respected and known across India. The Garuda pillar has sculptures depicting Garudas cutting their own heads. Garudas were bodyguards of kings and Queens who committed suicide upon the death of their masters.